A Energic patented system that revolutionised the attachment and articulation of implements. 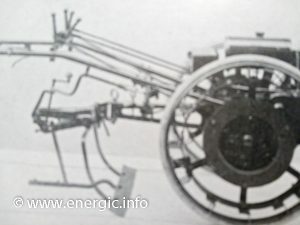 This meant that the versatile Energic motoculteurs became even more flexible and adaptable with this innovative design to a wide range of agricultural implements. Particularly useful in restricted working conditions found in vines, orchards, fruit farms ad plantations. 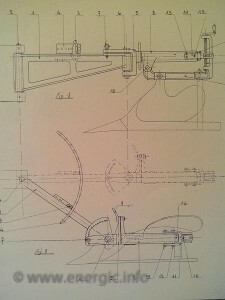 The system could be operated by hand and did not necessitate any spanners or keys to alter the angle and pivot required for different implements. France N° 731.381 & N°744.089, Germany N°632.686, England N° 409.156 and Italy N°315.442. 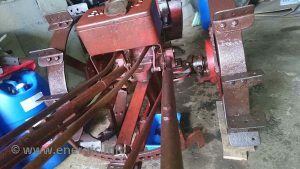 This draw bar mechanism is standard equipment on the B5, C7 B4L, C7, D9 and modified on the later G9’s.